TV Review: "Battlestar Galactica – ‘Resurrection Ship’"…….. 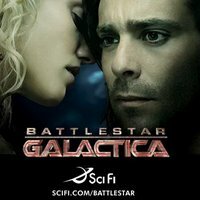 Season 2.5 of Battlestar Galactica kicked off last Friday night with the episode “Resurrection Ship”. The episode opens with the Battlestar’s Galactica and Pegasus on the brink. The situation is temporarily resolved and both commanders meet on neutral ground to discuss fighting the Cylons instead of each other. I am a huge fan of the original Battlestar Galactica and by and large of have enjoyed this new incarnation. I have not as yet been critical as many others have. That is about to change. Elements of this episode just made NO SENSE. First, even in the world of BSG the military answers to the civilian authority. That being the case why does President Roslyn not just demote the troublesome Admiral Cain and promote Adama? Instead she behaves as if the military is beyond her control. Later in the episode it is learned that not only has Admiral Cain not only executed civilians but also left a number of civilians ship to the mercy of the Cylons. At this point why is Cain not thrown into the brig to rot? Instead Roslyn further demonstrates her impotence by recommending that Adama kill Cain before Cain can kill him. This makes for interesting viewing to be sure but given that the producers of the show are on record as wanting the show to be more realistic than the original this plotting is simply baffling. Second, why would Cain promote Starbuck to captain and make her the CAG of the Pegasus? After all, Starbuck is an officer Cain hardly knows (and what she does know is not good from reading Adama’s logs) and by doing so she is promoting one of the people closest to Adama. Now perhaps this is a case of keeping your friends close and your enemies closer but there is no indication of that. Lastly, the closing moments of the episodes where each commander is seen plotting the demise of the other is ridiculous in the extreme. Does this mean that the episode was a failure? No. It was a quite compelling episodes but it strayed too far from reality. Given the fact that this show is hailed for its realism it is not difficult to find fault. By the way…..the Resurrection Ship itself looked suspiciously Borg-like to me.